← Happy Independence Day to the World’s Newest Free Nation! Ten years ago today, we thought that we would never laugh or smile again. How very wrong we were. 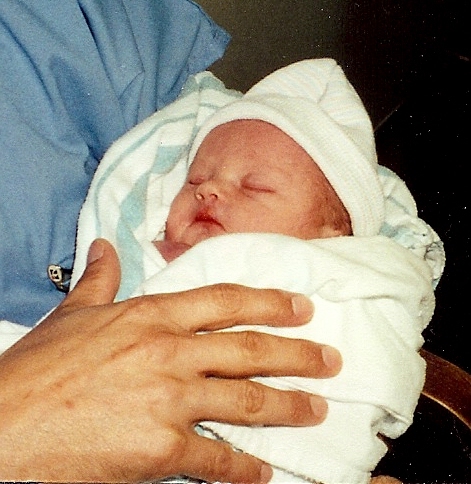 Ten years ago today, we thought that God had made a mistake and given this precious little girl to the wrong family. If God ever figures out that he really DID make a mistake, he’s not getting her back. Ten years ago today, we thought that life as we knew it was over. And in a way, that was true – our lives have never been the same. We are the richer because of a sweet little angel who was sent down from Heaven to brighten the lives of everyone around her. This entry was posted in Family, Special Occasions. Bookmark the permalink. That is the most beautiful, heartwarming tribute I’ve ever read, Teresa. And my, but this room is suddenly very, very dusty…. Idiot that I am, I forgot to wish Rebecca a HAPPY BIRTHDAY!!! Aggie, stop blowing your dust up this way!!! Beautifully put, Teresa. Happy Birthday to your little lady. Do we get some pictures of the birthday girl? Becca LOVED this, Beasn! Thanks so much! We know how much you are loved by your family and friends. Love from Great Uncle John and Great Aunt Imogene. And from all the other members of our family. 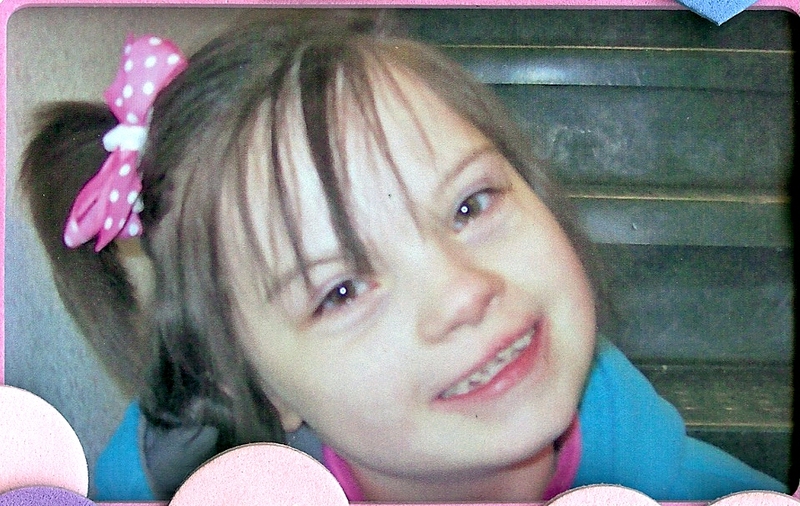 Happy Birthday Sweet Rebecca! I hope you do something fun on your special day. Lots of love to you from St. Louis. Won’t be long now before you guys have a little one of your own to enjoy – I can’t wait to see pictures of your cutie-pie! 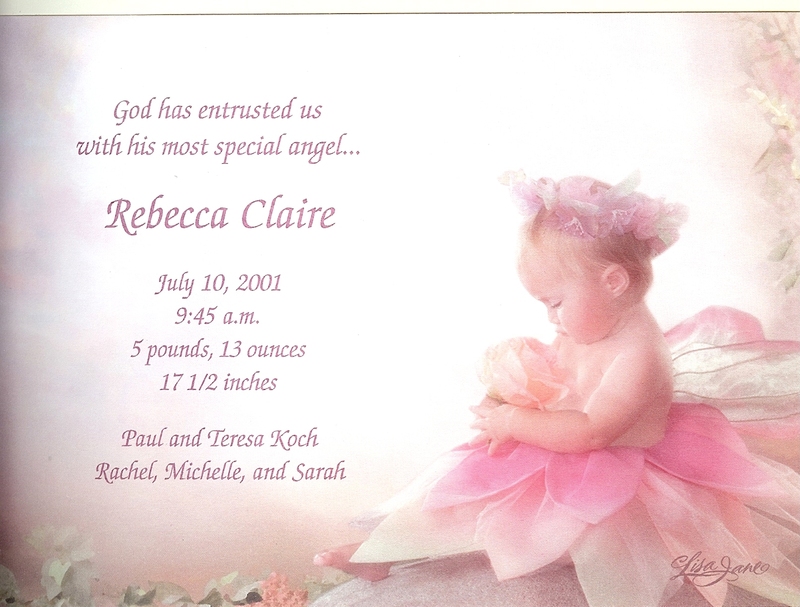 Happy Birthday Rebecca! Are you having cake today? What kind is your favorite? We are having a Gluten-Free Chocolate cake (Betty Crocker mix) with homemade chocolate buttercream icing. I’m going to blog about it tomorrow, ‘cuz 4 generations of family “helped” with the cake. I hope it has been filled with many great memories and happy moments! I can identify with some of your initial thoughts about Rebecca. While Ethan proved to be a very smart boy, there was always something about him that wasn’t quite ‘right’, from the reaction to loud sounds, to the fixations, and the alarming meltdowns and apparent lack of understanding about the simplest social conventions that the rest of us take for granted. When he was finally diagnosed, the psychologist painted a pretty bleak picture of his future, made all the more incomprehensible to me when I came to realize that my Dad probably had this too, and that I likely would be diagnosed with a milder case of it myself. Thankfully, with patience and hard work, we and his teachers have helped him to understand social situations and helped him to learn the skills necessary to navigate life at his age, and frankly, you might not understand that he isn’t quite “normal” at all unless you talked to him for an extended period of time. He still has great difficultly making friends, and that is painful for me to watch as a parent, despite the fact that my circle of friends when I was a child was far smaller than my circle of acquaintances. I have every confidence that with continued work, and some dedicated and steady friends, he will end up being just fine, or at least as fine as anyone growing up in this world can be. His little brother is a different story. He reacts to people very differently, which has pretty much ruled out “normal” classes for the foreseeable future. He is by no means stupid, and in little ways has let us, his teachers, and his grandparents know that he is very in tune with the world around him, even if he does not really participate in it most of the time. When he has cooperated with testing, he has indicated that there is absolutely nothing wrong with his intellect. But his emotional needs and responses are not by any means what you might expect from a usually bright-eyed seven year old boy. I find myself thankful every day that both are very affectionate with the people that they are close to, and I think it would be fair to say that their hearts are far more open and honest than mine at their ages. I try hard to be mindful of the way that they see the world, and count myself lucky in the fact that since I very likely have a mild case myself, that it isn’t too much of a stretch at times to do so. I don’t know that I ever questioned why they have Aspberger’s. I do know that I marvel at the strength and patience of other parents I know who have kids who have what would have been diagnosed with autism a few years ago, before they took it and Aspberger’s, PDD, and other diagnoses and lumped them together on the “autism spectrum”. I really don’t know how I would deal with the heartache of a child who wouldn’t look me in the eye, or talk to me, or hug me, or be able to tell me how they were feeling or what they were thinking. I realize that there are still rewards for these parents, and moments of victory that they share with their children, and that all the moments are still precious to them. I often think that while it is fortunate for me that Ethan and Jake are both the way that they are, I thank God for understanding the way that I am before he gave them to us, so that I could have those moments of self-discovery as I help them grow into everything that they can be. Sorry about wasting the space. I just wanted to let you know that you weren’t alone in those intial feelings, or your realizations as she grows older. You didn’t waste space, BiW – it’s obvious that you love your little guys bunches and bunches! They are fortunate, indeed to have a dad like you to help them navigate through life. We are lucky, in a way, because we HAD a diagnosis from the beginning. We had a chance to work through the grief and get on with the business of finding out what we needed to do to make Rebecca’s life as obstacle-free as we could. Autism is a much harder diagnosis to have to deal with. I loved your comment – don’t apologize for it!